Unknown source Remember the rainbow, God’s promise in the sky. I know this is not very helpful, but I know that at Brunswick we have a copy of the words and chords in our folders. Maybe your church has it filed away somewhere too. Good for kids. Tune In: Tune in (Natalie Sims) A simple kid’s song. “Tune in, tune in, there’s a message coming in.” Encourages kids to look for signs of God’s love. Lyrics, sample, songbook. Good for kids. Online resource: It’s a sign of God’s love (Richard Bruxvoort-Colligan) Not a congregational song – needs someone to sing this to the kids, really. Sample and lyrics Good for kids. Recorded Music "Just look up" (Eric Bibb / Michael Jerome Browne) On Eric Bibb's album "Friends" and on Putumayo's "Folk Playground". "There's a rainbow waiting for you, just look up". Sound sample. Good for kids. NCH391 / GtG315 / SFFS 2238 / Cha458 In the midst of new dimensions (Rush) "Now and ever, now and ever, now and evermore". I quite like this one. Good for this week: "God of rainbow, fiery pillar". 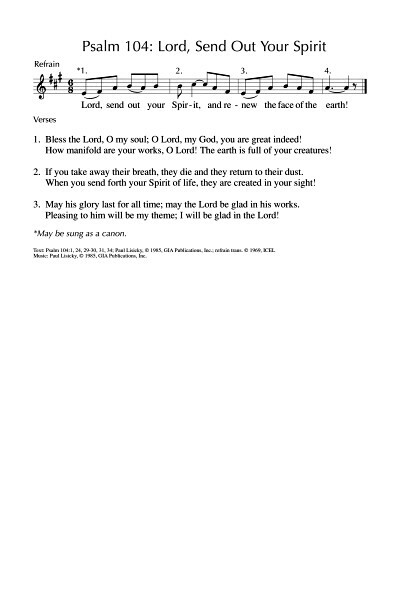 Hymnals vary in which verses they include. *ATA 142 / UMH134 / Traditional If I could I surely would / O Mary don’t you weep. Lots of fun, and good for kids, but I’m not quite sure where Mary weeping fits into Pharoah’s army getting (clap) drowned dead… Here's Bruce Springsteen's version, which I love. I've suggested it this week because of the verse "God gave Noah the rainbow sign - no more water but fire next time". Good for kids. STB114 Come holy spirit (Loh) A lovely 3 part chant. The congregation can sing one part, while a soprano and tenor cantor (or groups) sing the other two parts, or you could split an adventurous congregation into 3 parts. Will need to be taught. TiS 706 / Taize / AoV2-142 / A&M600 / SFFS 2013 / GtG544 / PH224 / GC(II)576 / G(3)620 / CP360 / PfAS103C / SP194 / Src79 / URW377 / Lau813 Bless the Lord my soul (Batastini / Taize) A beautiful and very well known Taize chant. Sound samples, sheet music. Good for kids. TiS 175 / GtB Did you ever see a kookaburra laugh A fun kid's song. "Where do all the good things come from?" Good for kids. *MV015 / GA186 Holy Sacred Spirit (Brown) Gentle chant. Can be used without the cantor part. "Holy Sacred Spirit, breathe your breath on us"
AoVK-123 / NCH3 / Iona (M&G) / UMH148 / VU308 / WoV794 / ELW837 / GtG021 / PH271 / G(II)338 / GC499 / G(3)911 / CP407 / W&R26 / Cha58 / URW232 / 82Hml-385 Many and Great O God are your works / Wakantanka Taku Nitawa (Lacquiparle) Good words. Simple tune. Sounds great accompanied by a good Native American-style drum beat, which is a great way to get people involved in music-making. Lyrics here. Good for kids, if you get the drums out. TiS 65 Send forth your spirit O Lord and renew the face of the earth (Murray) Cantored Psalm. Refrain is simple and inclusive. Verses do not use inclusive language for God. AoVK-113 Thank you O Lord for this world of ours (Barr) A good kids song in two parts. *TiS 188 Where wide sky rolls down and touches red sand (Smith) Great Australian imagery sung to a familiar hymn tune. Lyrics (scroll down). Sound sample. Sounds of Living Water 77 There's a river of life flowing out from me (Casebolt) I have found the lyrics to this, but I can't remember the second part at all. I think I only know the chorus. Maybe it's in a scripture in song book too. It's a happy clappy. Good for kids. MV160 There's a river of life that's flowing from God's throne (Maracle) This simple chorus will need to be taught as it is Native American (Mohawk) and makes use of vocables (!). It would work best with some percussion. AoVNG138 Tune our hearts / Tree of Life (Thompson) A lovely chant for the chorus, which would work with or without the verses. I'm not sure of all the lyrics for this as I don't have a copy. FFS51 O spring in the desert (David Adam) Christ's presence in water and light; Christ as guide. Excellent imagery, good tune. *NCH576 / CH706 / UMH428 / VU678 / A&M635 / GtG346 / GA513 / GC719 / GC(II)712 / G(3)803 / CP576 / CP(E) 427 / W&R621 / Cha668 / Lau886 / StF696 For the healing of the nations (Kaan) Excellent words seeking peaceful coexistence of the nations. Can be sung to a range of tunes including the very familiar WESTMINSTER ABBEY. Lyrics. New words to old tunes. Just look at Easter Day, please! *MV144 / SP&P073 Like a healing stream (Bruce Harding) Gentle folksy ballad with a lot of water imagery - healing stream, gentle rain, river strong and mighty sea. Would need to be introduced, but would catch on pretty quickly, I think. Sound sample, sheet music sample, and pdf for purchase. *AoV2-058 Pulsing Spirit rippling river (Dolores Dufner) Excellent lyrics to the very familiar hymn tune BEACH SPRING. Lyrics and sound sample. GC728 / GC(II)725 / G(3)819 / URW419 / Lau902 / MP554 Peace Is Flowing Like a River (Anon) A simple chorus. Great for kids and older people. You won't need to provide words for this after the first couple of verses, because only the first word changes. If you don't provide all the words, sometimes people look around them and notice each other. *Traditional / StJ / GC(II)567 As I went down to the river to pray (Folk song) Dunno about the "Good old way" bit, but the encouragement to pray together with each other is a good theme, and the song is a favourite in our congregation. I'm not sure if we've ever sung it as a congregation, but it would be good to do so. Here's the clip from O Brother Where art thou, which made it so popular. AA085 Let justice roll down like a river (Colin Gibson) Excellent song, and very easy to sing. Lyrics. Sheet music. Good for kids. 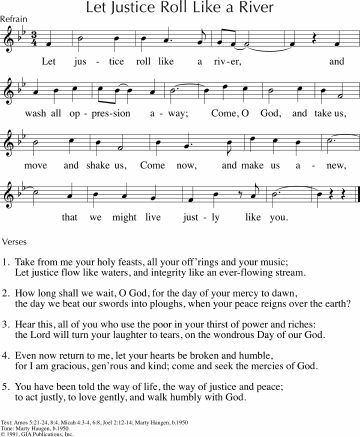 StS033 / GA515 / G(II)516 / GC716 / GC(II)709 Let Justice Roll Like a River (Marty Haugen) The song is quite simple, particularly if you use a soloist for the verses if this is new to you. Sound sample (I don't like this sample much) and sheet music sample and lyrics. ATFG563 How long? (Mann) How long must we cry out till justice rolls down like a river? MV087 Water flowing From the mountains (Hannah) A simple flowing song with lots of good water imagery. It's not specifically Christian, so could also be used in a multi-faith or secular gathering. *MV117 By the well a thirsty woman (Stilborn) An excellent song that brings the story of the woman at the well to us, with words of Christ being our source of living water. The tune will probably need to be taught. SP&P092 Empty jar clear and clean (James Manley) A simple song, seeking the openness to receive God's spirit, like a river rushing through.